What does Volume mean in Stocks? Volume in stocks refers to the total number of shares traded for a particular period of time. If 2 million shares are traded in a day, the trading volume for the day is 2 million. 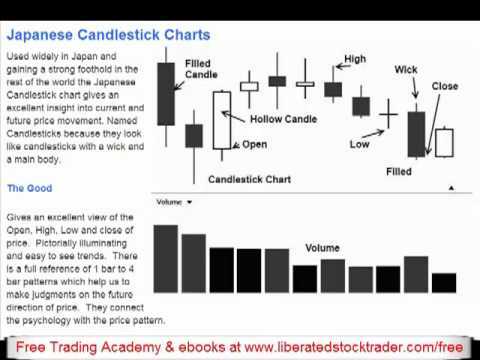 What is the Volume Stock Chart Indicator? Volume is usually expressed as a series of vertical bars at the bottom of a chart. If 20 shares were traded, then the bar will show 20,000. Often a Volume Chart – will show Red Bars when the stock price has decreased for the day, and Green Bars for when the price rises for the day. Is the Volume Indicator Important? Yes, Volume indicators in technical analysis are considered important, second only to stock price itself. When you combine the stock price movement with the increases or decreases in volume it provides a fascinating insight into the sentiment of the market. For example, if the stock price is going up and the volume is going down that indicates that there fewer people buying at the higher price. This means a change in demand and potential change in direction of the stock price. 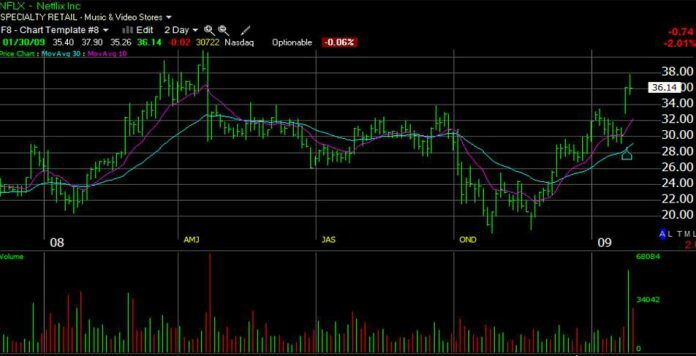 Look at the chart below for NetFlix (NFLX). Take a close look at volume and price and what they have in common. The volume indicator is configured to show a RED Bar if the closing price for the stock is lower than the opening price meaning “Negative Volume”, and green for days where the closing price is higher than the opening “Positive Volume”. Basic Volume Chart – Red bars when price decreases for the day, green bars for when the price rises for the day. What do you see in the Volume Chart? 3 Step Volume Analysis Walkthrough. 3 Key Steps Referenced in the Volume Chart. Here at point 1, we see a huge change in the direction of price, it was proceeding in a downward direction, then suddenly there was a spike in volume over 2 weeks, this is known as a “blow off bottom”. It indicates, that a key price has been found, where the sellers have lost enough that they need to sell the stock, and the buyers have seen the price decrease enough so that they see real value in the Stock. Of course, other factors contribute, like good news or earnings results. Whatever happened volume increased! The stock here increases from $20 to $38 in the following 3 months, a 90% increase, but how would we know this was about to happen. Well, buying at the time the moving averages crossed over would have been a good option, it would not have provided the full 90%, but it would have produced 40%, which by anyone’s reckoning is an excellent result. However here we see a monster “Blow off Top”, the huge red Spike, this is a very strong sign, to sell as soon as possible. From stage 2 we see the stock move in a sideways pattern and eventually decrease back down to $19, the ride is well and truly over. However, you would not own the stock, as you would have sold when the moving averages crossed. The stock price starts to increase in mid-November 2008, but volume tells us nothing. WHY? Indicators do not tell us something 100% of the time, but when they do we need to recognize it. The moving averages cross at $25, a good time to buy. Here we see massive buying; the volume goes through the roof. Important to note here is we are comparing volume for the stock in comparison to its history. This is the second biggest volume surge of the year for Netflix and is significant. It reported excellent earnings, and because of the recession, people were switching from buying bigger ticket items such as Cars and Plasma TV’s to staying at home and renting Movies. Netflix reported a massive increase in new members. In the chart, this note shows that the price “Gapped Up”. What does this mean? This means that the stock price in extended-hours trading was so strong that the Opening Price on the following day was significantly higher than even the High for the previous day, thus showing a gap in the price pattern in the chart. Warning: Some volatile stocks show a lot of Gaps in price. While gaps in price might sound good when they gap upwards, if they gap down against you then they are very bad. Avoid stocks with any history of strong negative gapping. As gaps do not give you the opportunity to sell at the price you want to. Volume is important and reading it should become second nature. Especially when searching for winning stocks, we ideally should look for stocks with increased volume so we have more chance of a quicker, less risk win. Is it Good to Have High Volume in Stocks? It depends. High volume when the price is decreasing means there is a large sell-off happening. High volume when the stock price is going up means there is a rally in the stock price and there a large demand for the stock. What is a Good Volume in Stock? Try to stick to trading stocks with at least $1 million traded per day. That means (Stock Price * Volume) = $ Volume Traded. There is another easy way to see if a stock has enough volume. If you see large gaps between the open and closing price for any stock it means there is not enough liquidity in the stock. This means not enough volume. Penny Stocks often do not have enough volume. For example, if the stock price is $1 and the volume is 5,000 that means only $5000 of stocks is traded in a single day, that is simply not for a fair and equitable market. There are some important characteristics of volume and price in the marketplace. It is all about the direction of price movement compared to the increases or decreases in volume. In short, it is about Buyers and Sellers. Price Up–Volume Up (PUVU) Stock Price moves higher on increased volume. This is bullish as it shows us that more participants are interested in selling the stock at higher prices and that most importantly more people are interested in buying the stock at those higher prices. In an uptrend this signals the trend will continue, in a downtrend, this signals a possible correction or change in the trend’s short-term direction to upwards. Price Up-Volume Down (PUVD) in an uptrend this is very bearish as it suggests that although prices are rising there are fewer participants suggesting people are backing away from the higher prices. This also infers that the trend is weakening. In a downtrend, it suggests a continuance of the downtrend. Price Down–Volume Up (PDVU) in a downtrend this may signal that a change in trend is likely, as we saw with the “Blow off bottom” there might be a huge selling climax, then the trend adjusts from down to sideways or down to up. In an uptrend, this may indicate a crisis, panic selling or simply when a stock is going out of favor. The pressure is on the sell side and to sell they have to accept lower prices. A strong negative signal! Price Down–Volume Down (PDVD) in a downtrend this can suggest that the retreat is slowing or beginning to end as there are fewer people interested in buying or selling the stock at these prices. In an uptrend, this may indicate the stock is stopping for breath or due a pullback before continuing on its upward trajectory. Volume tends to trend in the same direction as the price trend, so PDVD also suggests a continuation of the main downtrend, or a pullback and possible continuation of an uptrend. So you see not only the price but the direction of both price and volume is important. This is where the Price Volume Indicators play an important role. This was a lot of information and it is an important tool in your toolbox. I saw something similar to this on another website and didn’t really understand it, but your post helped me understand it better. Cheers! I have understand it better.Thanks. Just happened across your site. I agree, Volume is greatly underestimated by most traders and gives a very important edge to those that understand its value. Keep up the good work. I will toddle of and have a look at the rest of your site. Same thing happened with me as with Clarence, couldn’t understand a word the other guy wanted to say but I think I got something big out of your post. Thanks for your post. Hi RAC, thanks for the feedback. Hey I never thought about the dark charts. It is great input, I will change it for future posts 🙂 Thanks for the advice, I am getting older myself now too.